The report provides an overview of the statistical trends and changes in global populations of concern to UNHC, i.e. refugees, returnees, stateless persons, and certain groups of internally displaced persons (IDPs), place din the context of major humanitarian developments and displacement during the year. Some 19.5 million persons were refugees, 14.4 million under UNHCR’s mandate and 5.1 million Palestinian refugees registered by UNRWA. The global figure included 38.2 million internally displaced persons and nearly 1.8 million asylum-seekers. If these 59.5 million persons were a nation, they would make up the 24th largest in the world. An estimated 13.9 million individuals were newly displaced due to conflict or persecution in 2014. This includes 11.0 million persons newly displaced within the borders of their own country, the highest figure on record. The other 2.9 million individuals were new refugees. For the first time, Turkey became the largest refugee-hosting country worldwide, with 1.59 million refugees. Turkey was followed by Pakistan (1.51 million), Lebanon (1.15 million), the Islamic Republic of Iran (982,000), Ethiopia (659,500), and Jordan (654,100). More than half (53%) of all refugees worldwide came from just three countries: the Syrian Arab Republic (3.88 million), Afghanistan (2.59 million), and Somalia (1.11 million). Over the course of 2014,some 126,800 refugees returned to their countries of origin. This figure was the lowest level of refugee returns since 1983. A record high of nearly 1.7 million individuals submitted applications for asylum or refugee status in 2014. UNHCR offices registered 245,700 or 15 per cent of these claims. With 274,700 asylum claims, the Russian Federation was the world’s largest recipient of new individual applications, followed by Germany (173,100), the United States of America (121,200), and Turkey (87,800). Children below 18 years of age constituted 51 per cent of the refugee population in 2014, up from 41 per cent in 2009 and the highest figure in more than a decade. This is a summary of what was said by UNHCR spokesperson Karin de Gruijl – to whom quoted text may be attributed – at the press briefing, on 14 April 2015, at the Palais des Nations in Geneva. The Government of Kenya has announced that the Dadaab refugee camps should be closed within three months and the 350,000 Somali refugees living there returned to their country. The Government’s decision was announced this past weekend following the horrific attack at Garissa University earlier this month. UNHCR are pleased to announce the release of the 2014 Mid-Year Trends report, which is now available and may be downloaded from the UNHCR statistics website at: www.unhcr.org/statistics. The report provides a statistical overview of refugees, asylum-seekers, internally displaced persons (IDPs), returnees, stateless persons and other persons of concern to UNHCR for the period of 1 January to 30 June 2014. It is the second time only UNHCR is able to provide a global update at mid-year thanks to increased efforts put in place by both Headquarters and field colleagues. – Syrians have become the largest refugee population under UNHCR’s mandate, overtaking Afghans, who had held that position for more than three decades. At more than 3 million as of June 2014, Syrian refugees account for 23 per cent of all refugees under the organization’s mandate. I hope that you will find the 2014 Mid-Year Trends report useful and interesting. UNHCR is pleased to announce the launch of its online Protection Manual, UNHCR’s repository of protection policy and guidance documents. The Protection Manual is updated whenever a new protection policy or guidance document is published and can thus be relied upon to represent the current state of UNHCR protection policy / guidance. This new tool is accessible directly from the Refworld home screen (www.refworld.org, top right of the screen) and from the UNHCR website (www.unhcr.org, click “Protection Manual” under “resources”), or directly at www.refworld.org/protectionmanual.html. Any questions or remarks relating to the Protection Manual or user experiences, both positive and negative, can be sent to refworld@unhcr.org. We appreciate your feedback! 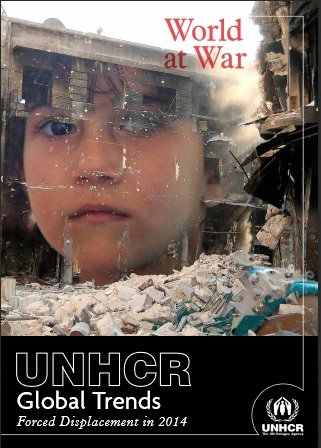 This is to inform you that the following report has been published today and can be downloaded from the UNHCR website at http://www.unhcr.org/532afe986.html. A. An estimated 612,700 asylum applications were registered in 2013 in the 44 industrialized countries covered by the report, some 133,000 claims more than the year before (+28%). This is the third consecutive annual increase and the second highest annual level of the past 20 years. B. With 109,600 new asylum applications registered during 2013, Germany was for the first time since 1999 the largest single recipient of new asylum claims among the group of industrialized countries. The United States of America was second with an estimated 88,400 asylum applications, followed by France (60,100), Sweden (54,300), and Turkey (44,800). 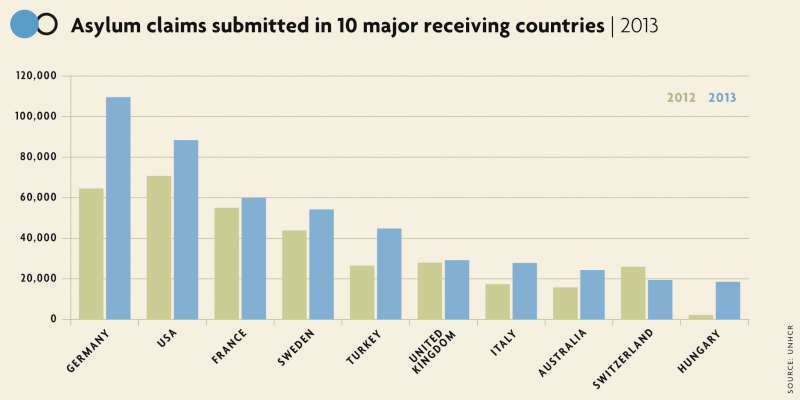 The top five receiving countries together accounted for six out of ten new asylum claims submitted in the 44 industrialized countries. C. The Syrian Arab Republic, the Russian Federation, Afghanistan, Iraq, and Serbia (and Kosovo: Security Council resolution 1244 (1999)) were the five top source countries of asylum-seekers in the 44 industrialized countries in 2013. Among the top-10 countries of origin six are currently experiencing violence or conflict – Syria, Afghanistan, Eritrea, Somalia, Iraq and Pakistan. D. The Syrian Arab Republic became for the first time the main country of origin of asylum-seekers in the 44 industrialized countries. Provisional data indicate that some 56,400 Syrians requested refugee status in 2013, more than double the number of 2012 (25,200 claims) and six times more than in 2011 (8,500 claims). The 2013 level is the highest number recorded by a single group among the industrialized countries since 1999.